Every week, we'll look back over the previous seven days of NBA action and identify the players who made noise on – and in some cases - off the court. Which players dominated the headlines in NBA week 17? The classy manner in which Harrison Barnes dealt with finding out he'd been traded to the Sacramento Kings while playing what turned out to be his final game for the Dallas Mavericks makes him the runaway winner of week 17. Barnes was subbed out of the game but remained on the bench to support his team-mates before heading to the locker room for official confirmation of his departure from Dallas. While social media - including LeBron James - went into a frenzy over Barnes' treatment, the 26-year-old forward kept things professional. Mavericks coach Rick Carlisle, who also learned of the Barnes trade mid-game, was effusive in his praise for the player, telling Brice Paterik of Mavs Moneyball: "Thanked him for over two-and-a-half years of being a model pro and being one of the most improved players in the game. I'm going to miss him an awful lot". The Mavericks echoed their coach's sentiments. Barnes completed his move to the Sacramento Kings and will now play a major role in their attempt to end the NBA's longest playoff drought. The Kings have not reached the postseason since 2006. 'PG13' is playing the best basketball of his career this season and has supplanted Russell Westbrook as the No 1 offensive option for the Thunder. He's averaging career-bests in points (28.7), rebounds (8.0), steals (a league-leading 2.3), three-pointers made (3.9) and free throws made (5.9) per game. His play over the last seven days has been nothing short of MVP-level with 45, 27 and 39-point performances in Thunder wins over the Houston Rockets, Memphis Grizzlies and Orlando Magic respectively. He made six three-pointers in each of those victories. George's 12-of-22 45-point effort on the road against Houston was superb as he out-duelled MVP rival James Harden (who scored 42 points but needed 28 shots to do so) and made four clutch free throws in the final four seconds to seal the win. Unsurprisingly, George's stellar play earned him Western Conference Player of the Week honours. He started week 18 started in even stronger fashion, pouring in a 47-point triple-double (including eight triples) as the Thunder thumped the Portland Trail Blazers 120-104. It's rare in the modern NBA that fans are collectively-vocal enough to impact a game so all credit goes to the home support at Indiana's Bankers Life Fieldhouse who serenaded Brandon Ingram and his fellow young Los Angeles team-mates with chants of "LeBron's going to trade you" during the Pacers' 136-94 blowout of the Lakers. The chants referred to the Lakers' ultimately fruitless pursuit of New Orleans Pelicans' Anthony Davis as the trade deadline loomed and the fact that Ingram, Kyle Kuzma and Lonzo Ball were all likely to be shipped out of Los Angeles in exchange for the All-Star forward. The Lakers young stars appeared to shrink in the moment as the rampant Pacers handed LeBron James the heaviest defeat of his entire career, thanks to 24 points from Bojan Bogdanovic and 22 points from Myles Turner. Hitting a game-winning shot at the buzzer to defeat your former team on their home court is a notable achievement in itself but, given the shellacking meted out to the Lakers in Indiana two nights before, Rajon Rondo's buzzer-beater at the TD Garden had even greater significance. 🏀 @RajonRondo hits buzzer-beating game-winner as #LakeShow stun #Celtics 129-128 in Boston. Rondo's last-second heroics capped a dramatic back-and-forth final minute in which both teams made clutch baskets before the former Celtics' point guard's 20ft jump shot earned the Lakers a memorable 129-128 win. As it turned out, Rondo had actually practised his game-winning shot earlier in the day on the TD Garden court with his young son. It's no exaggeration to say that Rondo's buzzer-beater gave the Lakers a much-needed boost at a time their season looked like it could unravel. Former All-Star forward Brand is in his first season as Sixers GM and has repeatedly shown he is not afraid to make franchise-changing decisions. 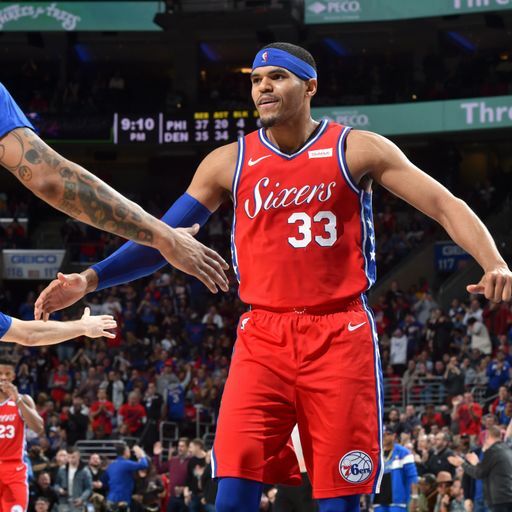 He pulled the trigger on a deal to bring Jimmy Butler to Philadelphia earlier in the season and was in decisive mood again at the trade deadline, acquiring Tobias Harris from the Los Angeles Clippers in a six-player trade. Will 76ers find cohesion with Harris? The Sixers now have a 'core four' of stars, but will they function cohesively? The 76ers are in full 'win now' mode, giving up rookie Landry Shamet, veterans Wilson Chandler and Mike Muscala and a slew of future Draft picks in the deal. But their almost All-Star level starting five of Harris, Butler, Joel Embiid, Ben Simmons and JJ Redick is talented enough to take them deep into to the postseason - at a minimum. Unlike many GMs, Brand is certainly not risk-averse. And unlike the destabilising pantomime produced by the Los Angeles Lakers' failed bid to land Anthony Davis, not a whisper about Harris' potential arrival leaked out of Philadelphia. No one saw Brand's move for Harris coming. Now it's up to coach Brett Brown to forge the firepower at his disposal into a cohesive Eastern Conference force.